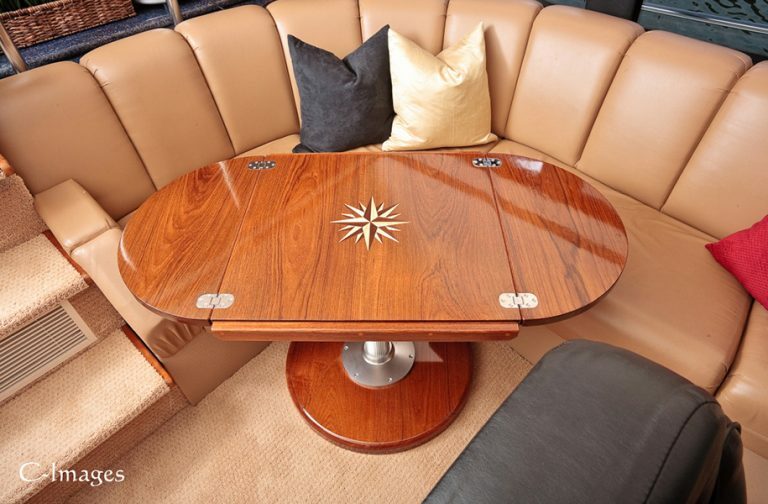 Cruising Concepts provides made to order teak cockpit and dining tables for yachts and sailboats. 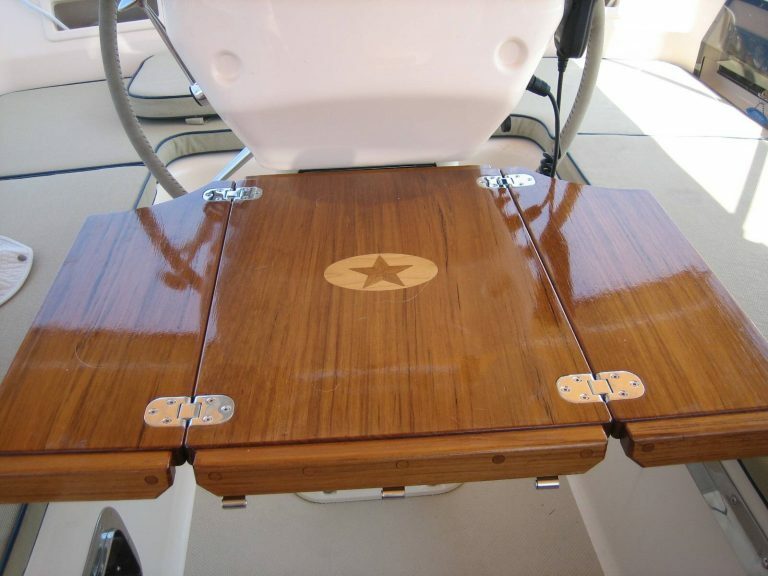 Our specially installed pneumatic pedestals and custom designed inlays give your boat table the perfect blend of style and utility. A sturdy, stylish table for your sailboat or yacht can amount to massive savings in time and space. At least it can if the tables are made by Cruising Concepts. A life of sailing has equipped us with a firm understanding of what a table is used for, and not used for, in the tight space of a sailboat cabin. Our yacht, cockpit, and dining tables are custom made to the customer’s specifications and can be round, square, oval, or any other shape that the installation area requires. We are especially confident and proud of our folding table designs which feature hinges specifically installed to limit interruption of the table surface and allow smooth folding for the leaves. We’ve designed numerous tables for cockpit and dining installations on sailboats and yachts, and all of our designs are prepared for extensive indoor and outdoor usage. Our tables come pre-fitted with pneumatic aluminum or solid teak pedestals which provide a durable and weighted base to secure the table while retaining its potential for a mobile and/or adjustable position. If the customer wants to attach the table to the mainmast or transom then we ship their table order with the proper mounting attachments. Our exactly measured products guarantee a proper fit in the customer’s intended installation space. All of Cruising Concepts’ teak designs are made from solid teak with no veneers or add-on cosmetics. Teak wood is durable, resilient, and has an excellent weight to thickness ratio, minimizing the added weight for the vessel. Our teak products are oiled and varnished for a crisp, classic look; or can remain with natural teak coloration and texture. In addition to its naturally pleasing appearance, teak wood is highly customizable and easily receives precision cuts and close fitting inlays. We also offer simple and sturdy starboard plastic tables with a variety of folding designs and pedestal options. Our starboard plastic comes in six color options and can be designed for the same installation options as our teak cockpit tables, including fold-up and four piece folding designs. Our starboard designs cannot support inlays, but they serve as an easy addition to any sailboat cockpit or yacht transom. Cruising Concepts started out designing the tables that we wish we’d had on our Catalina. We approach each table order as its own unique package and it’s always a delight for us to tackle our customers’ requests. We also keep extensive records of our work for our portfolio, and if you see a design or image that inspires you, let us know and we can recreate or adjust that pattern exactly as you like it. There are plenty of table options on the market, but a Cruising Concepts custom designed teak table will improve the quality, versatility, and charm of your sailboat or yacht in a way that no other product can.